AT FIVE am in the Galician countryside it’s very dark. We felt like the only people in the world as we walked down the lane from our hotel. The sky was full of stars, a dog barked distantly and we carried our walking poles so as not to clatter on the road as we passed through the sleeping hamlet. 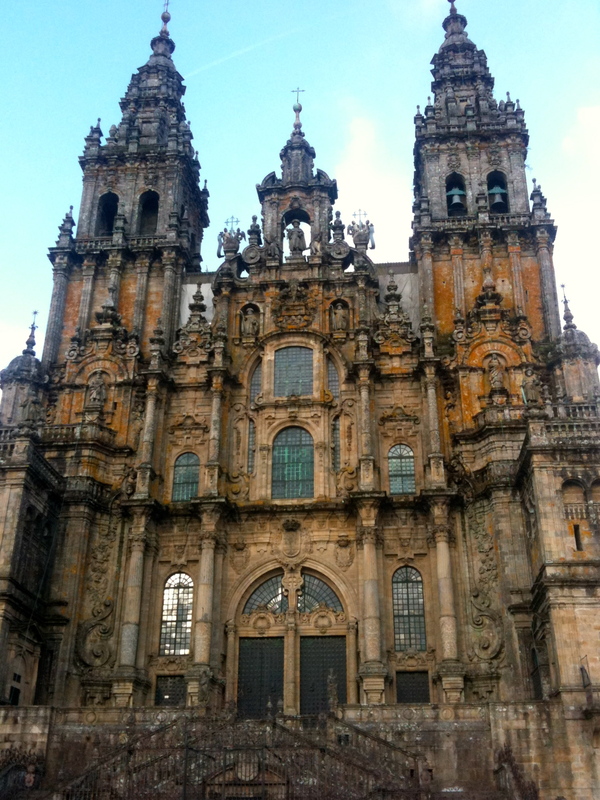 This was our fifth and last morning on the Camino de Santiago, and we had twenty-two kilometres to walk by mid-day in order to reach our destination, the daily pilgrims’ mass in the cathedral at Santiago de Compostela. Shortly we came to a crossroads. The camino is marked mainly with yellow arrows painted onto trees, walls, telegraph poles, even the tarmac itself. The paint fades and here it was pitch dark. We took a guess and twenty minutes later found ourselves climbing into the next small town described in the guidebook. As we walked up the deserted main street another soul appeared, carrying a heavy backpack and wearing a headlamp. We fell into step with him gratefully, feeling like the novices we were. Soon the path left the town and we were back in darkness again, climbing a leafy tunnel through oak woods. Our light-bearer was not talkative. 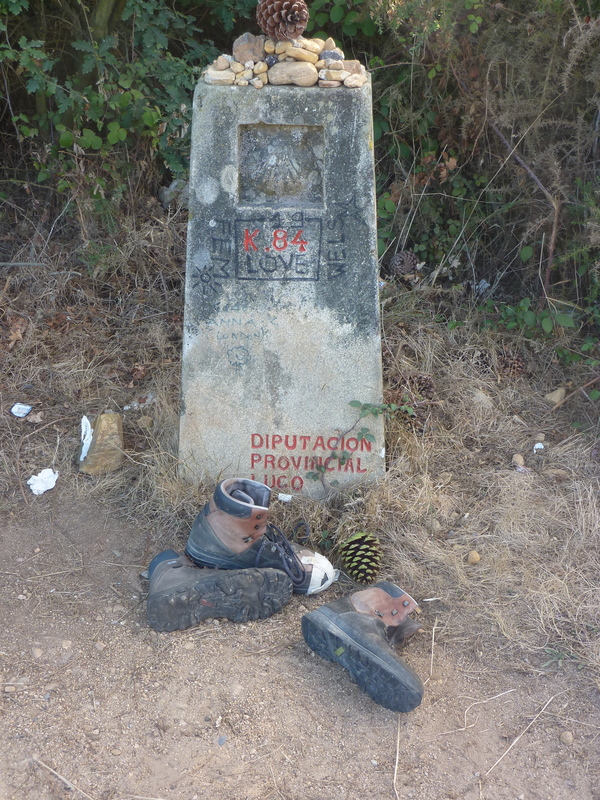 A Madrileño, he had been walking the northern, coastal route for a week at thirty-five kilometres a day, nearly double the distance we’d been covering. His pace left little breath for conversation. But for the moment we needed him, so we marched smartly along behind him. Other pilgrims were beginning to drift onto the path from their lodgings, solitary walkers, couples, little groups, sleepily mumbling ‘Buen camino’ to one another and talking in pre-dawn whispers. Pale pinpoints of light wavered through the woods ahead of us, the oaks now replaced by tall, scented eucalyptus trees. We could have left our Lucifer now, but it seemed we had become attached to him, drawn along in his slipstream as he forged on, overtaking everyone in his path. Dawn was a long time coming. Clouds had drifted in and a fine drizzle was falling – the first we had seen in five days – when the sky at last began to lighten. We had been climbing slowly but steadily for nearly two hours by now and a glance at the map showed that we had already covered more than eight kilometres. I was starting to worry that we would burn out at this pace, particularly since Sarah had begun to complain of an aching shin at the end of the previous day’s walking. So finally, though not without a certain reluctance, we thanked our guide for his light and watched him disappear down the path ahead of us. We were now on top of a plateau and making our way round the perimeter of Santiago’s airport. For half an hour or so we saw no other pilgrims. Perhaps we had missed the way and should have stayed with him. Or perhaps we really had overtaken everyone else, since no one would be joining the camino now until we reached the viewpoint and chapel at Monte del Gozo (Mount Joy – so named because, on a clear day, it offers weary pilgrims their first glimpse of the cathedral spires). Here minibuses disgorge day visitors to walk the final few kilometres into Santiago. We dropped over the edge of the plateau to where, as the path met a main road, an elderly man was up early, handing out leaflets for his guest house. Although it was almost full daylight now we could see no waymarkings. My instinct said we should go right, but we asked the man and he directed us left. After an anxious twenty minutes, we picked up the signs again and at the same time sighted another group ahead. The drizzle was getting heavier and Sarah was beginning to limp. I knew she was in pain; I also knew that, having initially dismissed the idea of attending the mass as being insignificant to non-believers such as us, over the last twenty-four hours, for reasons neither of us really understood, completing the journey at the proper hour, in the proper manner, had started to become the most important thing in our lives. This was soon to become a true journey of the heart, a fact which physical exertion, immersion in a new landscape, curiosity about our fellow pilgrims, and the gradual return of rusty Spanish, had so far largely conspired to keep from us. We took a break, sheltering from the rain under the eaves of a house. Sarah changed her footwear and we ate the sandwich the hotel had provided for breakfast. Then, with ten kilometres still to go, we set off again. WE’D IMAGINED that the camino would be an endless succession of travellers’ tales as we moved along in a happy throng of pilgims, slipping easily into conversation with whoever took our fancy. It wasn’t quite like that. The walking required concentration and effort as we climbed and dipped on a variety of surfaces – from tarmac to stony shepherds’ paths – through wooded hills and farmland, ever watchful for the next yellow arrow. People walked determinedly, purposefully. Many had been on the road for a month and had already covered more than 400 miles by the time we joined them. Now they were scenting journey’s end. They were young, too, surprisingly so. We had pictured middle-aged pilgrims, but the majority were in their twenties and thirties – and Spanish. But there were older walkers as well, and a good smattering of other nationalities. At our first stop, on the first day, we got talking to a spirited young Australian and her Dutch companion. They had four weeks’ walking behind them and we longed to know what it had been like for them. But rather than regale us with their stories she wanted to know about us, where we were from and how long we had been going. We told her we were a mere two hours into our journey. She sent us on our way with a warm smile and words of well-wishing and encouragement. Later that day we fell in with a solitary Englishwoman, a faded upper-class rose. She was at pains to assert her independence, though we sensed her need for conversation. There was a story there but neither of us felt inclined to hear it. Perhaps towards the end of the journey we would have welcomed her company more than we did. But this was the first day and the camino hadn’t yet begun to pry us open. On the second day we travelled for an hour or so with a pair of older New Zealand women, both Steiner teachers. The one I walked with began to tell me about her adult son who had become schizophrenic through drug abuse. She related her story with the detachment of someone who needs to protect themselves from the rawness of the truth. I was startled to find myself thinking that as a fellow pilgrim I should be doing something more than simply listening. There was obviously nothing for me to say, so for the rest of her story I concentrated on listening with as much empathy as I could. On the third day – at nearly thirty kilometres, the longest and most exhausting day of the journey – we walked for a while with a Spanish father and daughter. Helen was in her late twenties and had been working as an education officer for the Spanish embassy in Niger. Blas, her father, ran a sports shop in Madrid. A lean seventy-year-old with an easy stride and a broad grin, he seemed to be bursting with the joy of his daughter’s company. She was equally happy to be spending precious time with him. She carried the heavier pack and attentively, though unnecessarily, placed a hand at his elbow when they came to a road. Their easy companionship and affection for one another touched us both. These encounters and conversations, brief as they were, were gradually revealing a broader consciousness of which, like migrating salmon, we were as much a part as everyone else on the journey. It was this, perhaps even more than any personal determination, that drew us out from the shelter of the eaves and back into the rain with ten kilometres still to go on that last morning of the Camino de Santiago. MOUNT JOY was not joyous that morning. Low cloud and light drizzle obscured the distant cathedral. Having completed our final climb we’d been walking along a wooded ridge that seemed to go on forever, past a vast timberyard, past the sprawling campus of TV Galicia, and now we were resting in the shadow of a large and hideous monument commemorating the visit to Santiago of Pope John Paul II. Sarah’s shin had been growing more and more painful. I’d realised fairly early on that being solicitous was no help and that the best thing was just to keep going, since that was clearly what she was determined to do. Some of the time I walked in front, some of the time behind. I would never have thought that the sight of a bedraggled figure plodding doggedly along in the drizzle, head bent beneath a backpack, grimacing at every other step, could stir such strong feelings; but as the kilometres passed my admiration grew and grew and my heart swelled with it. Our Spanish friends, Helen and Blas, daughter and father, caught up with us as we rested, sitting on a low wall. They were struggling too, they admitted. But there was something uplifting about their closeness to one another and I think we drew energy from it. We set off again, down into a valley on whose opposite side Santiago sprawls across the shoulders of another plateau. We crossed over a motorway and into the outskirts of the town and all at once there were brass scallop shells set into the pavement, beckoning us along the final leg of the camino. Over the last twenty-four hours we had also been keeping an eye out for our young Australian friend. We had seen her a couple of times during the early part of the journey and each time her warmth, openness and cheerfulness had spurred us on. At our last meeting, with nearly five hundred miles under her belt, we’d asked her what she was going to do next. ‘I’ll just have to keep going to Finisterre,’ she’d replied with a smile. Cape Finisterre falls short by sixteen kilometres of fulfilling its claim to be the end of the earth; Cabo da Roca in Portugal is actually the westernmost point of continental Europe. But for pilgrims who find they can’t stop in Santiago, the extra eighty kilometres lead to an unequivocal terminus in the form of a rocky headland pounded by Atlantic breakers. By now our Australian friend had come to embody the spirit of the journey for us, and we both felt that we needed to see her one more time. Meanwhile, there were still a couple of kilometres of hard pavement to go to the centre of Santiago. It felt odd to be dragging ourselves through busy city streets, carrying our packs and poles, travel-stained and exhausted, while people in everyday clothes walked by on their way to the shops or to work – though we were by no means alone. A gathering stream of other pilgrims, singly, in pairs or in little groups, threaded their way through the crowds, their compasses similarly set on the cathedral square. ONCE WE reached the old part of Santiago with its narrow streets and shady arcades, we knew we were almost at journey’s end. We had spent our first night there before catching the bus back up country for the start of the walk. After dinner that evening we had strolled away from the restaurant to find ourselves caught up in a swelling crowd, making its way towards the cathedral. Curious, we allowed ourselves to be swept along, and at the very moment we arrived in the square, packed with several thousand people, all the lights went out. For the next thirty minutes we were treated to a spectacular son-et-lumière, projected onto the façade of the cathedral which reared into the darkness like a vast mottled cliff, sculpted by wind and rain into fantastic embellishments and ornamentations. Even in daylight, seen now across the town rooftops, the spires were impressive – a beacon for footsore, weary pilgrims. We were approaching the cathedral from behind and above. As we passed what looked like a small bishop’s palace with an ornamental garden in front of it, an exuberant group of a dozen or so young pilgrims came in from a side street and broke into song. Now we could see down to the deep archway that led into the cathedral square, and this first glimpse of our destination, combined with the cheerfully raised voices, provoked a strong wave of emotion and I was surprised to feel my eyes start to water. We followed the group down the slope, Sarah hobbling determinedly behind me, and as we approached the archway we began to hear Galician pipes above the voices. 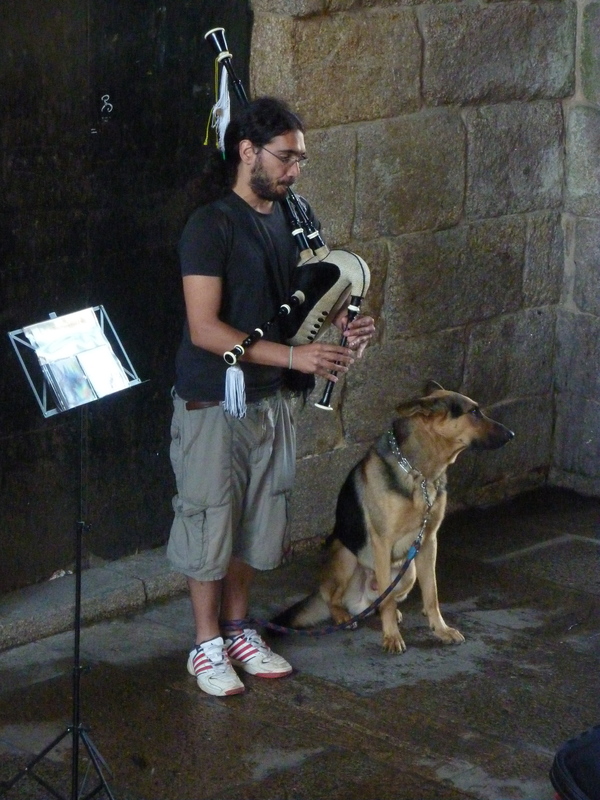 In the shadows of the archway was a young piper in traditional dress, accompanied by his dog. He broke into a jig as we entered the arch and the music filled it, quickening our pace for the final few steps. Then we were in the square, suddenly overcome with emotion. We stood there and hugged each other and wept. The square is at least the size of a football pitch. It was filling up with tourists, locals and pilgrims, many sitting or lying stretched out exhausted on the flagstones, surrounded by their walking paraphernalia as if in some modern caravanserai. It was eleven o’clock and we’d made it with an hour to spare. We limped to a cafe just off the square, ordered coffee and took off our boots to wait there for midday. Though we’d walked less than a fifth of the distance some of the other pilgrims had covered, the sense of achievement was almost overwhelming. Later we made our way into the cathedral and found a pew, stowing our walking gear like everyone else at our feet. The mass lasted an hour and at one point priests from half a dozen different countries stepped forward in turn to address the congregation in their native tongues, all framed by the fantastically ornate gilded cave in which sits a larger-than-life-size effigy of Saint James. Sadly they didn’t swing the botafumeiro, the enormous incense burner which is suspended from high above the apse and takes several priests to set in motion. Originally intended to fumigate travel-stained pilgrims, today its purpose is more theatrical than hygienic. Before the service began we had glimpsed our Australian friend and exchanged congratulatory smiles. As we left the cathedral we realised that we badly wanted to find her and tell her how much she had come to represent the spirit of the camino for us. We never did. Over the next twenty-four hours we scanned bars and plazas and cafes but she wasn’t there. Perhaps she had already left for Finisterre. She will never know how much she gave us heart for our journey. But perhaps that is what happens on the camino. Unknowingly we all give each other heart, because of the common purpose, the connection to some long, deep pulse of humanity. Why else would we have felt as we did, that our hearts were almost bursting, when we finally walked into the cathedral square? What a gorgeous account. I’ll be setting off for the Camino in May. This lifts my heart in anticipation. I’m sure you won’t be disappointed. Buen camino!